January concluded with temperatures that were very near "normal" as the first half of the month was generally cold and the second half of the month warm. February started with a warm (albeit wet) day yesterday but a MUCH colder day today. It appears the temperature roller coaster will continue all week with seasonal days Tuesday and Wednesday, but a sharp drop Wednesday night that could result in some precipitation changing over to light snow overnight. Thursday will be another day not unlike today, then rising temps are expected again heading into the weekend. In this blog, I focus on Wednesday night's precipitation. After rising into the 50s Wednesday, a strong cold front will move through in the evening, bringing light precipitation to the area. As the rain moves in, temperatures will fall quickly into the 30s with the potential for precip to change to light snow overnight. All precipitation looks like it will be gone by dawn Thursday, leaving clouds and a cold wind behind. 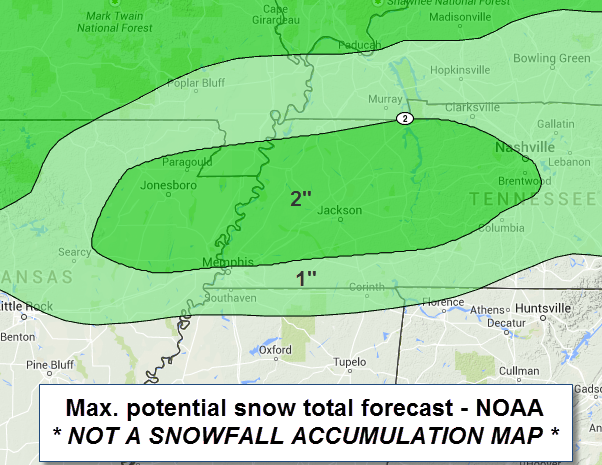 Total (liquid) precipitation amounts will likely be under 0.25"and probably closer to 0.10". The "Short-Range Ensemble Forecast" (SREF) probability of 1" snowfall Wednesday night. For the metro, that probability is about 20%. Graphic courtesy WxBell. 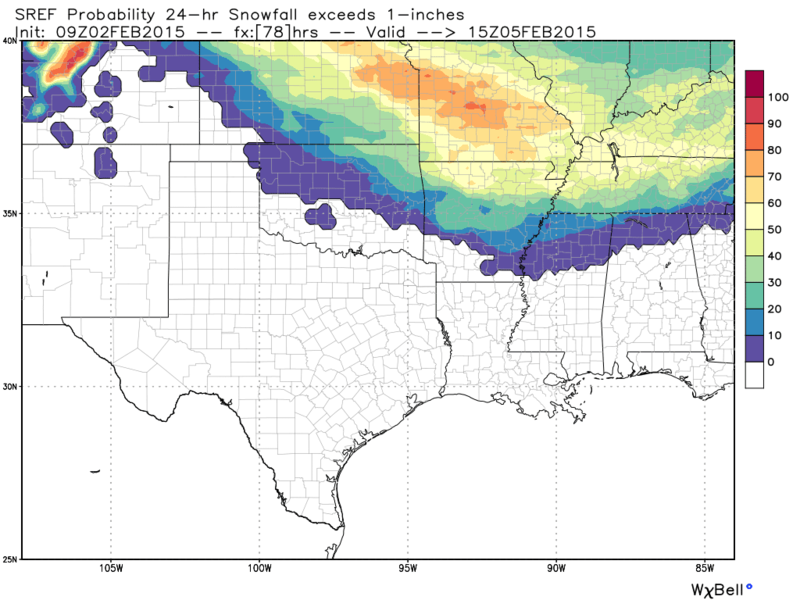 NOAA's Weather Prediction Center gives us a slightly lower probability of 1" of snow as the SREF model. This graphic is the 95th percentile forecast for snowfall from the Weather Prediction Center, which means there is only a 5% chance we'll get more than indicated. The 95th percentile is generally treated as a worst case (or "best case" considering your feelings towards snow) scenario. THIS IS NOT A SNOWFALL ACCUMULATION FORECAST. 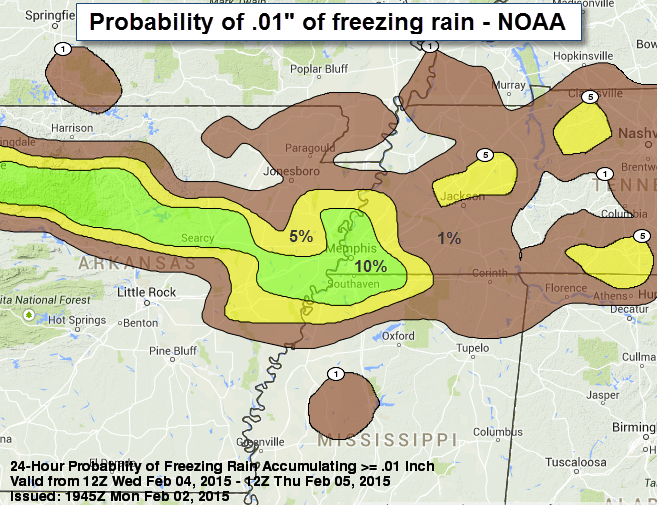 Finally, since rain-to-snow is the forecast, here are the probabilities of a very minor accumulation of freezing rain. The chance is near zero of any accumulation of ice. 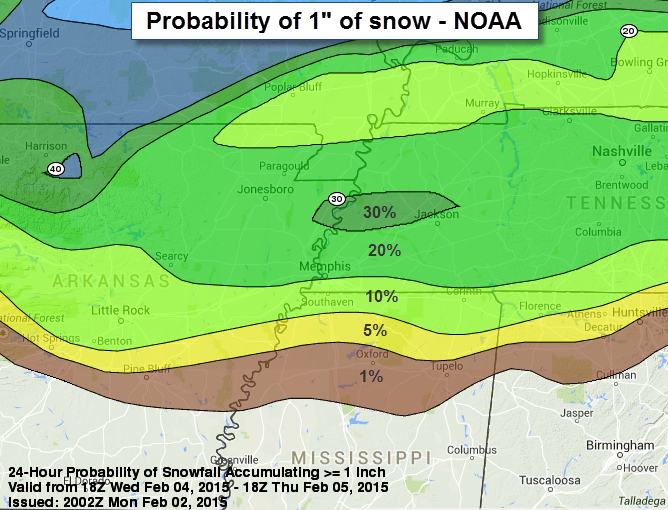 Graphic courtesy NOAA/Weather Prediction Center. Light rain has a better than 50/50 chance of changing to light snow Wednesday overnight. The most likely scenario has minor accumulation (less than 1" and more likely 1/2" or less) on grassy and exposed surfaces. Roadways would be just wet due to warm ground from temperatures in the 50s just several hours earlier. Probably not enough to close schools, IF it were to happen. At this time, a "boom" forecast for this event would be 1-2" on grassy surfaces and a bit of slush on elevated roadways, while a "bust" would be nothing. 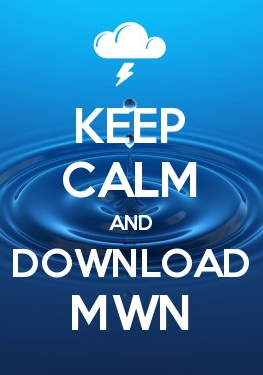 The MWN Snow Counter currently reads 1,153 days since the last official 1" snowfall. We'll update again in the next day or two as we have more data to work with and the event gets closer. The key appears to be how fast temperatures drop as precipitation falls and that will become clearer (hopefully) as we get closer to Wednesday night. In the meantime, we'll post any new info on our social media accounts listed below. 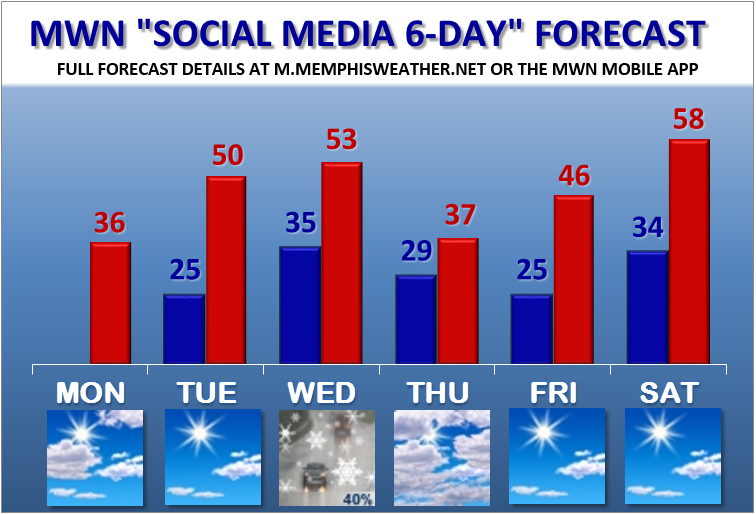 Here's our official forecast and below is a graphical 6-day planner.